Defined simply, a healthy diet means eating foods that improve one’s health. It involves eating the proper amounts of food that contain necessary nutrients for the body and taking in sufficient amounts of water for proper hydration. 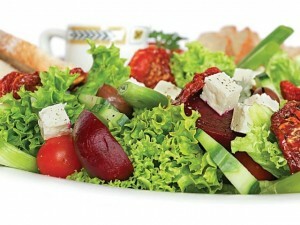 A healthy diet not only improves one’s health, it also helps prevent, and even cure, certain serious medical conditions. With these basics, unhealthy diets are considered as the most preventable cause of death all over the world. Unhealthy diets are a major factor in the development of chronic medical conditions such as hypertension, an abnormality in blood lipids, cancer, obesity and heart diseases. According to the World Health Organization, about 2.7 million people die partly because of very low consumption of vegetables and fruits each year. All over the world, unhealthy diets are the main cause of 19% of cancers in the gastrointestinal area. It is also the cause of 11% of strokes and 31% of ischemia (heart disease). A comprehensive report compiled by major cancer institutes in the world show that there is an important link between lifestyle (which includes diet) and the prevention of cancer. These same reports also recommend the consumption of mostly plant-originated foods in order to obtain necessary nutrients for the body. It also recommends limiting the intake of red meat, salt, energy-dense foods, processed meat and sugars. A healthy diet naturally has low amounts of sodium. A high level of sodium in the body is one of the primary causes of hypertension. A 2008 study showed that eating a diet low in sodium has contributed significantly to a reduction in the blood pressure of people who participated in the study. This improvement was exhibited by people who were considered to have normal blood pressure as well as those who had hypertension. A healthy diet specific for hypertensive people is the DASH (Dietary Approaches to Stop Hypertension) diet. This type of diet was also promoted by the United States’ heart, blood and lung institutes. Basically, DASH limits sodium intake and encourages consumption of nuts, fish, fruits, whole grains, poultry and vegetables. It also limits the intake of red meats and sweets (sugars). The DASH is also rich in magnesium, potassium and calcium. A healthy diet, combined with regular exercise, can prevent obesity. Obesity is a major factor in the development of major health conditions such as heart diseases and diabetes. A healthy diet promoting weight loss should be low in fat, low in carbohydrates and low in calories. Hypertension occurs in approximately 8–10% of pregnancies.Most women with hypertension in pregnancy have pre-existing primary hypertension, but high blood pressure in pregnancy may be the first sign of pre-eclampsia, a serious condition of the second half of pregnancy and puerperium.